The Testing sub-team is charged with the testing of features and bug fixes of the ArchivesSpace application prior to new releases of ArchivesSpace. The sub-team is a cross-council sub-team that is made up of members of the ArchivesSpace User Advisory and Technical Advisory Councils. The Testing subteam was created in January 2016 following a decision to split the former Features Prioritization and Testing team into two separate groups. The 2018-2019 sub-team consists of Brittany Newberry (Atlanta University Center), Dallas Pillen (University of Michigan), Angela White (Indiana University – Purdue University Indianapolis), and Joshua Shaw (Dartmouth College). Christina Di Bella serves as Program Liaison for the sub-team. Major activities of the sub-team include testing of new features, such as the Assessment module, as well as bug fixes reported in JIRA and community pull requests in GitHub. We also perform regression testing to make sure that things that were previously working still are with changes in the application. The majority of our testing follows the development roadmap for ArchivesSpace. Testing occurs whenever there is a new release candidate or sprints of new community pull requests and JIRA bug fixes. To test, members of the sub-team use either the ArchivesSpace test site or download their own instance of the application. Instructions to complete the testing documentation. In order to efficiently test the functions of ArchivesSpace and bug fixes when there is a new release candidate or sprints of fixes, the chair of the sub-team will assign two members to each function, bug fix, and community pull request. These assignments ensure that multiple people test the function and make comments on whether it passes or fails. Each function is tested using two permission levels, admin and one other, in order to make sure that the defaults for permissions are working. 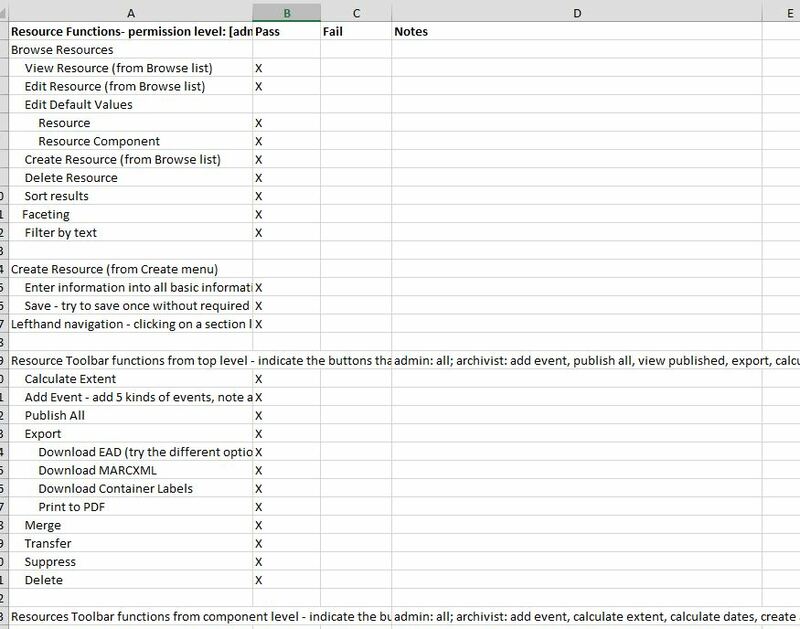 Tracking pass/fail of functions while testing release candidates. The sub-team works hard to provide information on functions that may have failed during testing. We include notes and screenshots in our testing spreadsheets in order to provide accurate feedback. If you have any questions or want more information about the Testing sub-team, contact me, Brittany, at bnewberry@auctr.edu. Brittany Newberry is a Processing Archivist at the Atlanta University Center Robert W. Woodruff Library. She is currently the leader of the ArchivesSpace Users Advisory/Technical Advisory Council’s Testing sub-team.